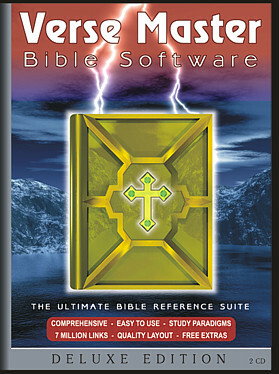 Verse Master Deluxe Bible Commentary Library Software - 70% Off Retail! Large update over the previous Verse Master version. Much easier to use, several more books, higher quality layout! So, for those who bought the previous version of Verse Master, this new one is improved greatly over the one you purchased and would be well worth buying! PRODUCT CONDITION: Brand new, never opened, and straight from the manufacturer! Includes Adam Clarke's Unabridged Six-volume Commentary on the Bible! Looking for a Bible library with one or more of the modern day Bible translations (NASB, etc) for a LOW price? CLICK HERE. We have two modern day Bible translations on this product! You will not be disappointed! Buy it cheap on Godrules.NET! Great gift item for your pastor, friends, family, etc. Some Christian bookstores sell our Verse Master Standard for $99.95! Verse Master Deluxe is worth $199.95. I say worth $199.95, because that is the level on which it competes with the quality of the competitor's products. With that said, the MSRP for the item is $79.95, though its worth more. Buy it here direct for $35.95 + S&H! This Bible library has same amount of resources as the highest editions of most major Bible software packages currently selling in Christian bookstores, yet costs much less than them ALL!! Just check out the below comparison between our Bible Software and the leading competitors(PC Study Bible, QuickVerse, eBible). Also, this Bible library has many improvements over these $200 - $400 competitor libraries. For instance, Verse Master Bible Library has several million more linked cross-references, a high quality graphical layout and 3D maps! Verse Master Deluxe comes sealed in an Amaray retail box as a 2 CD set. Definitely a great gift item! Do not be fooled by the $250 - $450 Bible libraries programs that you see in Christian bookstores. They boast something better, but under close scrutiny, you discover there is no difference at all. Many think that there is an actual reason for the high cost, as if something was unique about their software. I have discussed this issue with many people and it seems that every time we come up empty handed when trying to think of one solid reason for the high prices. Some say "its the study paradigms". I have included 3 study paradigms in my library, so that can't be it. Others say its because it has proprietary Bibles like the NIV or NKJV. I don't think the NIV or NKJV are worth the added $200+ expense. So, there is only one conclusion: someone wants more money. What other answer is there? What Verse Master Deluxe v2.0 Includes! The Deluxe Edition gives you 4 more Bibles, 50 highly detailed maps(VR and 3D renderings also), 200 full color pictures, all pictures and maps are integrated into the study w/ passage citations and hundreds of thousands more linked cross-references. Overall, Verse Master Deluxe has 12 more books than Light Master Bible Library. This is a brand new! You are bidding on high quality software. Buy one of the low priced Bible libraries that is currently selling on the internet and compare it with ours. I can guarantee that our software is of a higher caliber and won't end up on your shelf never used. I have a few of these low priced titles currently selling on the internet. They do not inform you that their libraries have NO linked cross-references. You might as well buy regular books, because their software is not anymore high tech. The software I am selling here has about 8 MILLION linked cross-references, truly making it a high quality Bible software product! My company (C-Corp- Optasia Electronics, Inc.) sells about 50,000 Bible Library packages every year. I have 4 different Bible libraries that I sell in almost all major chain stores, some Christian bookstores and even on eBay.com. Our Bible library selling in the secular chain stores is called, "Bible Wisdom" that we sell through TOPICS Entertainment. I am telling you all this, so you know you are not buying a cheap Bible library made by an inexperienced programmer. Most libraries selling on the net are a collection of freeware files, just thrown together. If you are looking for a quality Bible library for a low price, buy from me! NO internet access required for this library (all books on CD). No zip files. No unlocking anything. What you see is really what it is! Want to pay with a check instead of credit card? No problem, just enter your check information electronically and it just like sending it to me personally, but saves both of us time! Functionality – This library contains about 8 million cross-references connecting 50 Christian book sets(45,000 DOCUMENT FILES!!!!!). It has four times as many cross-references as QuickVerse or PC Study Bible! These are not just Bible cross-references either. Quite literally, all the books are netted together with linked cross-references, allowing travel among all the books. Chronological, topical, and parallel cross-references are all included within the library! A Unique Book Selection – Verse Master includes literally every genre of biblical study: Bibles, Bible History, Church History, Commentary, Sermons, Word Study, Lexicon, Theology, Topical, Dictionary, Philosophy, and Devotionals!! A Comprehensive Library – Verse Master contains volumes and volumes of Bible study materials. This makes it as large as Deluxe Editions of various competitors (PC Study Bible, Logos, etc). 15 Bibles – Compared with all various Bible libraries selling out there(over 30), our Bible library is near the top for providing the most Bibles in a single library! Also, each Bible is paralleled to the other Bibles by chapter, making it easy to compare them! Where else can you get this kind of high caliber library for under $200 in Christian bookstores? Connectivity – Verse Master works seamlessly with the Internet, because the CD library uses Internet Explorer as its browser. Internet is NOT needed to use the library. The whole library is on the CDs. Refer to the link above to view all the books on the software. BUT, it should be noted that many extra books can be accessed online from this library. So, you can access about 90 volumes from the CD itself and about another 80 volumes online for free from the browser! Books like NIV, NKJV can be accessed online for free from this software. Simply just connect to the internet to access the extra books. Greek and Hebrew – Even Greek and Hebrew materials are available on this CD!! View the Greek NT and Hebrew OT, 8 VOL of Greek Lexicon, KJV w/ Hebrew Strongs, etc. Hebrew and Greek study tools are easy to use on Verse Master! Pictures and Maps – How about 50 detailed, full color, high quality maps(3D, topographical, travels) AND 200 pictures of famous paintings, 3D renderings and more!!! Integrated Study Paradigms – Also, three study paradigms have been integrated into Verse Master Bible Library to make studying scripture not only easier, but also more fulfilling. Textured backgrounds on all books. High quality graphics utilized for button links, logos, and page titles. The user can quickly search the books. The CD search is extremely fast. Highly developed java search engine is integrated into the software. A better library for a lower price! Verse Master includes as many books as the competitor's high-level Bible libraries. Verse Master Deluxe includes 2 CDs(Install/Library CDs in full product Box). Verse Master Deluxe was created to work like a website on a CD-ROM. If you can surf the web, you can browse this CD library! With so many cross-references, you can quickly find the information you are looking for. Most comparable Christian bookstore libraries sell for hundreds of dollars. "I enjoy the The Master version" - Dale Golman. Two Family Christian Bookstore clerks indicated that they think Verse Master is better than all the other libraries for its price! IMPORTANT! - The first item has a shipping cost of $4.95. For each additional item, the shipping costs $2.95. For international orders, please add $2 more to the shipping costs. 486/66 MHz or higher processor. To buy this item, please click the "Buy Now" button below.